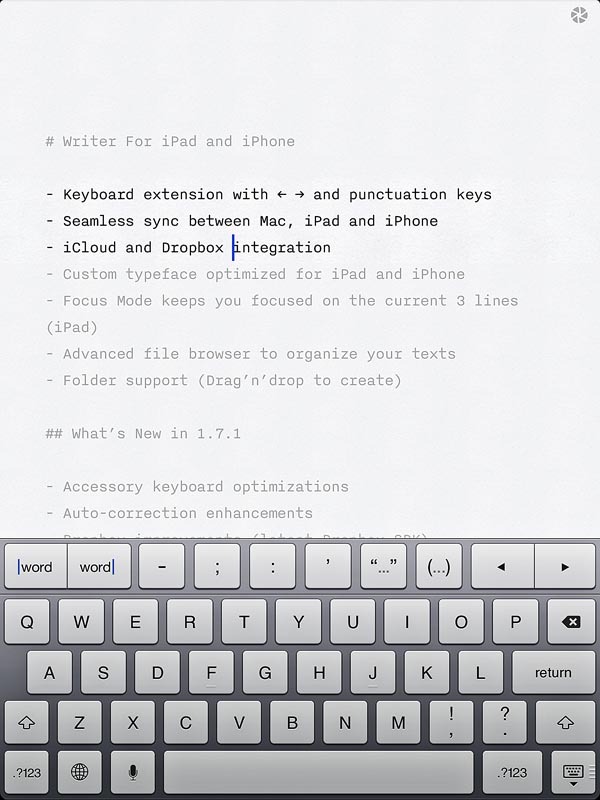 This is a comparison of the advantages and disadvantages (pros and cons) of two writing apps for the ipad - the free Notepad and the iwriter, one of the least expensive writing apps developed for the ipad. Both these can be used off-line. Cloud-on is also free, but not mentioned here as it needs a continuos internet connection. The free inbuilt writing notepad app in the ipad (see image below) is very basic. The keypad has limited functionality and no formatting. The fonts keep changing if you cut and paste. The background is a yellow and lined. Not that one can control spacing! 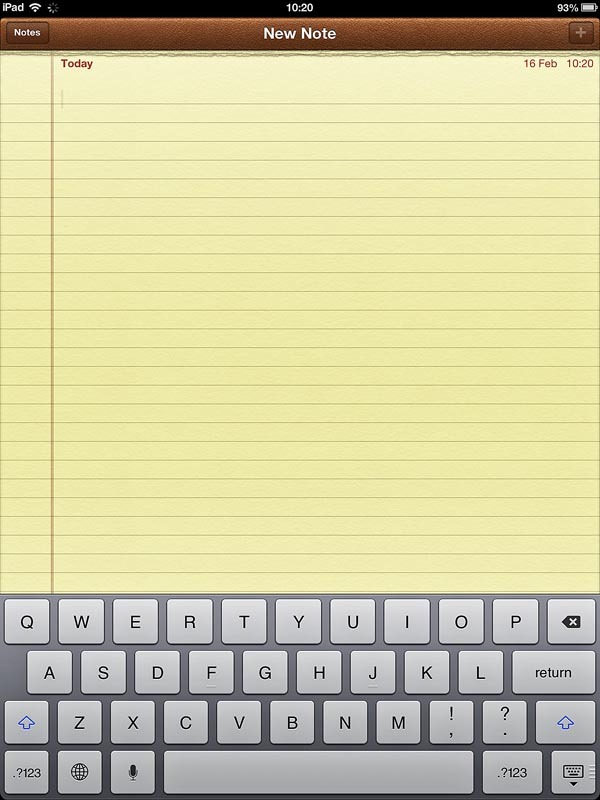 Notepad has 3 different keypads in two languages - for letters, numbers and symbols. The other language depends on which country one buys the ipad in. It is difficult to move the cursor between words and letters. The image on the left demonstrates the way we are expected to move the cursor if one wants to alter what has been typed. After holding one's finger gently over the spot, a bubble appears (like the one in the left image) and the cursor can be moved to any position within the bubble. Tapping the ipad a little differently will do other things like selecting the word or spell checking so one has to be careful. The advantage of the built-in notepad is that it syncs very well (and fast) with one's computer (via icloud) and so as you type the document is replicated on your personal pc but for this one has to be online. A Hindi language keypad of an ipad notepad bought in India. The iwriter (₹50) has an advantage. 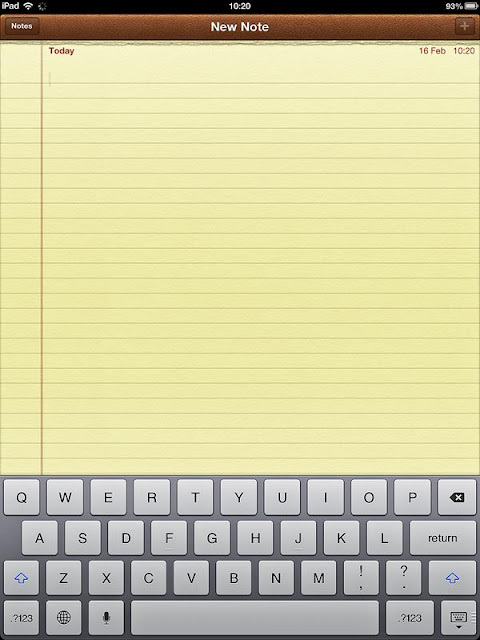 It's a clean white sheet, and one can move between different words and also letters if one needs to edit. This keypad also has symbols for parenthesis, dashes and inverted commas on the main keyboard so one need not keep switching keyboards. Tapping the little flower-like symbol of the top one can highlight just the few lines. An added advantage for serious writers. The language keypad is better as it has the ₹ symbol. Quite essential! In iwriter one can type one can name the document as you make it, but in the Notepad, the first few words of the document automatically become the document name. If the beginning changes, so does the name of the document! 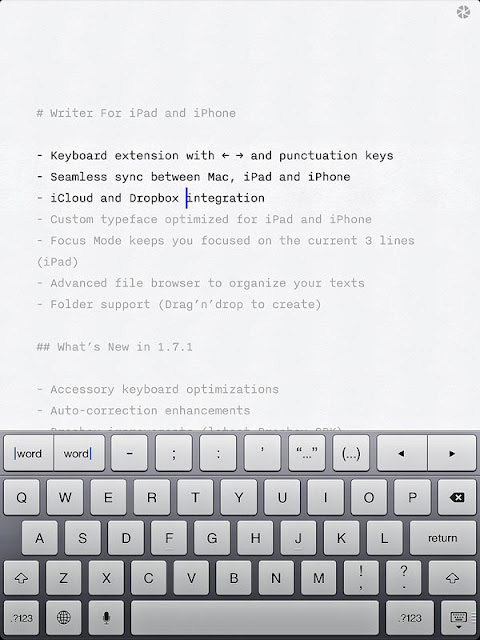 There is no formatting in iwriter either, but at least it doesn't play havoc like the formatting in Notepad. It's simply a plain and simple text document. Like writing in html. No surprises here. This is a huge relief as the Notepad formatting is a nightmare! Almost like Apple's conspiracy to force you to not use it! Unfortunately one has to use it as it automatically syncs with your icloud account. 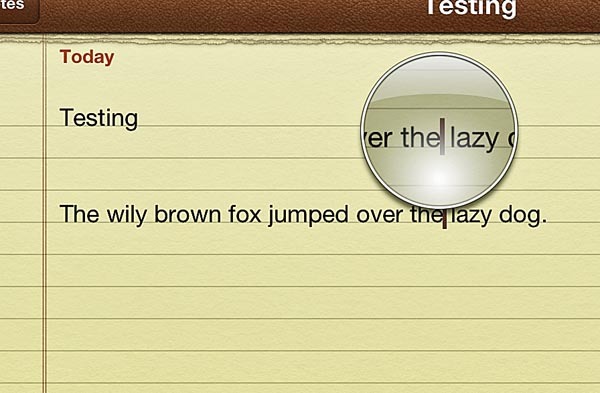 Miss-spelled words are highlighted and easy to correct in both apps. However neither app allows you to access the dictionary. This is an irritant as you cannot add or delete words. The apps add words automatically but not always intelligently. There is no search and find function in either app, and to anyone who writes a lot of pages, this is a disadvantage. 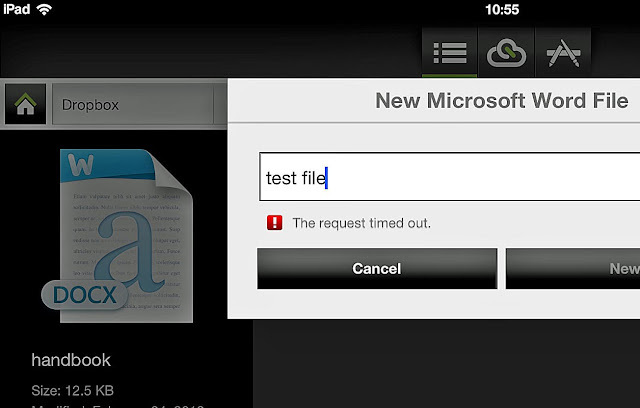 A free app which allows you to write in Word Document format, with all its features, is also available for free but it needs constant connectivity to the internet. It saves all your files to Dropbox which you can access on other writing apps on the ipad and also on your computer. Below is the Cloudon free app image. I tried to make a file named "test file" but as it was a slow internet connection it didn't happen.